Because of the current open comment period on the Draft Environmental Impact Statement (DEIS) on the Proposed Rule Changes for Mexican Wolf Reintroduction and the recent hearings on the same, I’ve been spending a bit of time with the DEIS and trying to wade through all 467 pages of U.S. Fish and Wildlife Service’s new plans for recovering the wolves. I’ve written about it generally here and flagged the fact that the new rule allows for the hook and bullet boys (a.k.a. the state wildlife “management” agencies) to have wolves removed where they are having an unacceptable impact on elk, deer, and other wild ungulates. The proposed rule then goes on to elaborate the proof that the state wildlife agencies would need to meet, including having adequate and actual data that the herds are below objectives due to wolves, and having this request peer-reviewed prior too submission to the Service for the permit to kill those wolves. I guess it depends on whether the hunters whining about not being able to shoot an elk from their pick-up anymore counts as an unacceptable impact. Do unfulfilled deer tags count as evidence? The Arizona Game and Fish Department explains the situation with a completely unfunny comic: But seriously folks, didn’t these people study the classic predator/prey relationship in Ecology 101? Or don’t they require that for a RangeManagement degree? 😉 But consider what is having the real impact on the populations of ungulates in Arizona and New Mexico: Livestock. Since cows are allowed to remove anywhere from 40-60 percent of the palatable forage on any public lands, that’s removing it from the prey base that would otherwise flourish in their absence. Let’s talk about unacceptable impacts and get permits for removing the cows! Well, said, Greta! My family was in the cattle business in a significant way, nevertheless I see clearly just how devastating the impact of livestock has been on our public lands. And not just to wolves, either. As you’ve pointed out, cows displace the native populations of ungulates, but they also displace many other species including every species dependent upon prairie dog colonies, and by virtue of water contamination and the destruction of stream beds, countless fish, amphibians, insects and song birds. When you hear that AZ and NM will also have “management authority over wolf numbers based upon their purported impact on elk” without addressing the 800lb gorilla of livestock, it’s clear what the agenda is. The graphic portrait of how many game animals are starved (if USFS/BLM over-allocate forage on allotments) by one AUM is derived from data provided to me by New Mexico Department of Fish and Game (Cal Baca, Private Lands Programs) in response to a question at a public hearing. The actual numbers are 2.1 elk, 7.8 mule deer, and 10.8 pronghorn. 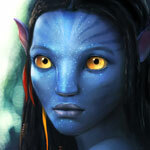 I think, but am not positive, that they obtained the information from the Natural Resources Conservation Service. The extractive industry corporations and would-be public lands privatizers work hard to dupe livestock owners and hunters into fighting government agencies and conservation groups — but if they ever gain control livestock owners will be lucky to get jobs as ranch foremen and hunters will have to pay like they do in Texas. Let’s get together folks. Yeah…it was pretty sad and embarrassing to see this cartoon accompanying our fish and game director’s letter to the editor. 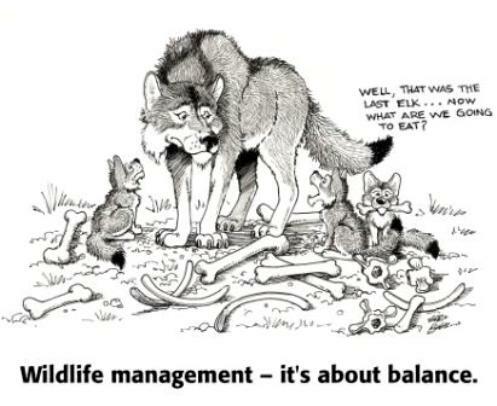 That drawing is a total farce and to think that an agency biologist actually “rendered” the drawing and allowed it to be used to help make the claim for balance in managing the mexican gray wolf is a complete joke…..par for the course here in Aritucky. I can’t believe they could think this cartoon was okay??? I’m going to go out on a limb here and call into consideration the Ecology 101 graph. After a recent conversation with one of David Mech’s associates, one may conclude that this sort of graph might occur in a closed system such as Isle Royale. Nothing can really emigrate or immigrate from the archipelago. Plus, no hunting or livestock on Isle Royale. Time is still important for Yellowstone, and other places in the NRM. Will yellowstone elk rebound or not? Even in northern MN where wolves are and have been plentiful, Winter is the greatest variable. The graph may not fit all locales. So in using Dr. Mech’s wisdom, perhaps this graph is not suitable for all areas, and once the natural prey numbers are driven down…will livestock take a hit. I like your comment I think it is amazing how many people don’t understand that basic Ecology 101 dynamic. When I talk to fellow hunters it is clear that many do not understand this, and it is because wildlife management is based on trying to maintain a stable horizontal line for game animal populations. In order to do that you have to also maintain a stable horizontal line for predatory animals. When hunters talk about the need to “balance” wildlife and manage predators it is because they want to maintain those stable lines. That idea of balance ensures that there will be enough animals to hunt every year into the foreseeable future as opposed to hunting only in years at the top of the population cycle. I have to admit, that certainly benefits me even though most of my hunting is in roadless and wilderness areas. When non-consumptive conservationists talk about “balance” I wonder how many also assume that there is a natural balance that also resembles horizontal lines for both predator and prey. Many seem to have the idea that if not hunted there will always be an abundance of both predator and prey animals, but as the graph shows the populations would be cyclical. Bottom line is I don’t think that most hunters or other conservationists understand (or maybe are unaware)the graph as shown above and that in places where nature is allowed to completely rule itself there will be times of plenty and famine for both predator and prey animals. But again each situation has different variables. Like you said Immer, in a place like Isle Royal or Yellowstone where no hunting is allowed such a relationship may be allowed to play out. Time will tell how much the elk herds in Yellowstone will rebound and how closely the wolf vs elk dynamic will follow that graph. Once progressions, or is it regressions, are factored in (had a student do this once with Isle Royale data, and he got that nice inverse sign wave relationship. I believe the Hudson Bay Company had some real nice data that supports this type of relationship hidden in their trapping records. Up here, we had an awful lot of snowshoe hare this past winter, which brought in Lynx. Just south of the Canadian border here in Ely is about the farthest southern extension for lynx. I’m not sure that fire would be enough in the Lolo, the time I spend there tells me that there is enough forage there to support many more elk and deer than currently inhabit the area. In a top-down ecosystem the prey animals are limited by predators not by the amount of forage. Fire would increase the amount of forage but the elk and deer populations will ultimately be controlled by bears, wolves and mtn. lions. Winter is also a big part of management for target species. Since winters cannot be controlled game departments have to manage harvest seasons. A few years ago in Idaho hard winters killed a lot of deer. To compensate, the fish and game department ended the hunting season for females for 2 years, once the population recovered the ability to kill females was reinstated. I think that lynx and other small predators probably follow the inverse sine curve better than large predators because they are more limited to what they can kill. Since lynx probably aren’t all that successful at taking down deer and elk they are tied to a single prey, the snowshoe hare whereas a wolf can switch between deer and elk and moose. Intersting topic, certainly a lot I still would like to study and each area has its differences. When there is a conflict on our public lands between cattle and wildlife like wolves, grizzly bears and elk, it is the cattle that must be removed – not the wildlife. That ranching industry may consist only of about 26,000 ranches in the US West, but their wealth and their influence (much of it fictional due to historical fantasy, but if anyone believes that fictional influence is not real in the human mind, is gravely mistaken about how that unfortunate organ operates) is inordinate politically. Just as John Wayne never went to a war, but merely used his rather bullying personality and overlarge size to convince awe-struck vicarious lives through skilled cameramen, so do most believe he was some kind of heroo. Teddy Roosevelt hated predators, and had appointed or been involved with gifford Pinchot – who felt that nature existed to milk, milk, milk for human growth growth growth, so do most benighted economists and politicians, and humans who want more STUFF. These are those who support the public lands agencies dead agenda of managing the lands for whoever has the most wealth – political power, illusionary or no. I agree that all the human exploitation endangering nature on public lands (and guins are NOT nature – but are an aberrance of but a few hundred years, and should be included in the numerous things needing bans on public lands (just this week, my car was shot by one of those urban hunters – and pickup trucks, guns, tech, are all urban all the time, no matter WHAT lies promoted by ranchers or supposed rural people – there would be NO ranches, no cattle industry, if it were not for vast urban markets. Every one with a gun is urban, and out of touch with real life. there was not even private land until the 1600s – 1700s – before that, it was owned by force – kings, etc. or not at all. native indigenous did not have such an egotistical concept. Since public lands are the final refuge of real, self-willed, wild life, it stands only to reason that they should remain natural, unexploited, producing the clean waters, air (only plants can produce oxygen and consume carbon dioxide. Greedy corporations cannot, nor can selfish “Americans”), peace, diverse biological life. There is no other resource for life. I think the point here is that it is not uncommon for state management agencies to ignore basic ecological considerations in wildlife management. To infer that a tiny endangered struggling Mexican wolf population will eat all the elk in the recovery area is grossly inappropriate. Instead of taking the opportunity to inform they instead used a cartoon to reinforce invalid stereotypes of wolves that already face extreme prejudice, the biggest challenge to their recovery. This cartoon is appalling. The defense of it is equally so. The treatment of predators under state wildlife management plans is dismal at best. I don’t find this at all surprising. And mess with agency predator bias at your own risk, if you are an independent scientist. “having adequate and actual data that the herds are below objectives due to wolves” seems like a difficult thing to demonstrate, if a skeptic is going to be the judge. I am curious about the details there. Yeah, I can’t believe biologists agreed to that cartoon. If eating the last elk is the threshold of evidence I might approve (with some extra fine print about what happened in a control area). I would like to know where the wild horses fit into this equation. Thanls! Long before carrying capacity is reached, wolves start killing each other over territory. They regulate themselves and will never kill “the last elk” or the last anything. It’s people who do that. Wolves may self regulate by killing each other but it is possible for wolves to eliminate a prey species if another prey base is available. In a system with one predator and one prey species, the predator cannot tak eth eprey to exticntion due to decling rates of return resulting in starvation of the predator and resurgence of the prey. THe graph in the article above shows this relationship. In an ecosystem with more than one prey species, the more vulnerable species will be in danger of elimination because once prey #1 population drops, the predator can maintain high populations by feeding on prey #2 and continue to exert pressure on prey #1. Explaining this in a short commment is difficult but it is called “Predator-mediated competition”. That cartoon seemed pretty ignorant for a state agency thats suppose to manage wildlife based on “science”. I don’t think it is hunters that you need to convince about reducing/removing livestock and the resultant increase in game populations that could occur(unless they are also ranchers). It is Americans as a whole who want their cheap McDonalds hamburger. Maybe smart hunters out west are painfully aware, but here out east, where public land grazing is essentially unknown and little discussed, the pupils (hunters, enviro types, and – hint,hint – cow-meat producers) need that lesson. There are allot of us, and ranchers don’t influence us much. I don’t think that most hunters or other conservationists understand (or maybe are unaware)the graph as shown above and that in places where nature is allowed to completely rule itself there will be times of plenty and famine for both predator and prey animals. Yes, I am aware of this, and this is nature’s design – and I do not subscribe to the theory that Nature can be improved upon by mankind, because our intent is to improve things for ourselves only, and it always results in disastrous consequences. There are feast and famine years, and this applies to human beings as well, in times past not every hunt was successful, but today we expect that. It made human beings in ages past very creative and frugal with the use of resources, and today, because all of our needs are met, we are wasteful and selfish. I freely admit that I couldn’t care less about hunters, but that I reluctantly have to put up with them. I agree that abundance has made man wasteful or at least the appearance of abundance but I refute that most hunters think that success should be assured. Today, elk hunting success averages 17-20% across most western states. That success rate is very similar to pre-wolf introduction. Hunters know that success isn’t guaranteed but they want to at least see a legal animal during their hunt. Many hunters go an entire season without ever seeing an animal they can harvest. I myself have gone an entire season without seeing a legal elk despite putting many miles of footwork into the effort. But I don’t blame wolves for that, elk are sometimes just hard to find. Unfortunately, the biggest whiners and the ones who get all the publicity are the hunters who never get their fat butts off their ATV’s and it’s not surprising they are unsuccessful and would be whether wolves are present or not. An excellent point, and one repeated through the past few decades. How many more wild critters could live on the range if we could reduce cattle and all the attendant fiasco of their management? Would anyone have valid and current info on the annual amount of beef produced on the public lands, especially in comparison to that produced strictly in the feed-lot process? Can such a distinction be made? It could be a great tool to counter arguments that once and final removal of cattle from public lands would bring about economic apocalypse.